The Syrian government is holding a two-day meeting with members of the ruling Baath party and its opponents. The government says the Damascus meeting will begin discussion of possible reforms, including multi-party elections and a new media law. But many opposition leaders and protest organisers have refused to attend. Rights groups estimate that more than 1,750 people, including 350 security personnel, have been killed as the government tries to quell the protests. The government has blamed "armed criminal gangs" for the unrest, which began in mid-March as protests swept other nations in the Middle East and North Africa. Vice President Farouk al-Shara opened the meeting saying he hoped that Syria would eventually become a pluralistic democracy. The question is whether the process of national dialogue is believable; whether it is going to happen, whether it has any credibility and whether it will take along the opposition with it. It is quite clear that many of the people who actually represent those who are protesting are not turning up. They say they can't do so as long as the government is killing and torturing people. The president has said really quite big things in terms of the extent of the reform that's on offer. There is a history in Syria of all sorts of things being promised by the regime in terms of reform and then nothing actually materialises. Clearly the people going out in the streets do not believe it will happen. "We are going to hold a comprehensive national dialogue during which we will announce Syria's transition towards a multi-party democratic state in which everyone will be equal and able to participate in the building of the nation's future," he said. Mr Shura added that the government would end a ban on Syrians travelling abroad, or returning from overseas, "within a week". Dissident writer Tayyeb Tizini noted that bullets were still being fired in Homs and Hama, and called for the dismantling of the police state. "That's an absolute prerequisite, because otherwise the police state will sabotage all our efforts to tackle our problems together," AFP quoted Mr Tizini as saying. "They should also have freed the thousands of detainees, some of whom have been in prison for years. That would have been a present for the people and the meeting." When President Bashar al-Assad first announced the dialogue last month he said he wanted a comprehensive process that would deal with the different issues facing the Syrian people. The initial meeting is due to last two days and set up some form of political process, the time frame of which has not yet been established. The credibility of the national dialogue process will depend to a large extent on which opposition figures participate, says the BBC's Owen Bennett-Jones in Beirut. Although state media says opposition figures, independents, academics and youth activists were to attend the first "national dialogue", our correspondent says many leading opposition figures are boycotting the meeting, saying the authorities need to first show they were serious about talks by stopping the violence against civilians. "Nobody can talk about dialogue while the tanks surround the cities and while security services still take activists from their homes," said Abdul-Karim Rihawi, the head of the Syrian Human Rights League, who is not attending the meeting. "Nobody can share in this dialogue while they're torturing and arresting killing people in the streets," Mr Rihawi told BBC's Newshour programme. International journalists have been denied access to Syria. Organisers of the protest movement gave the slogan No Dialogue Friday to the demonstrations two days ago. Hundreds of thousands of people turned up for an anti-government rally in the central city of Hama on Friday, activists said, despite moves by security forces to quell demonstrations. State media reported President Assad had named Anas Naim as the city's new governor, following Ahmad Khaled Abdel Aziz's dismissal on 2 July after massive anti-regime protests. Mr Naim told BBC Arabic his predecessor's resignation had nothing to do with the protests in Hama, and said fewer than 100 demonstrators had been arrested in the city. Meanwhile, the foreign ministry summoned the French and US ambassadors to Syria on Sunday to protest against a visit they made to Hama last week, Syrian media said. The state-run news agency Sana said the visit constituted "flagrant interference in Syria's domestic affairs". 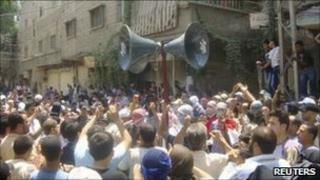 At least 14 people were reportedly killed on Friday in protests around the country, including six in a Damascus suburb.